Wow! I love those fabrics. Especially the skeleton in a dress! I’ll bet you’ll have a lot of fun beading on them. I can’t wait to see it!! Wow. this is so dramatic. 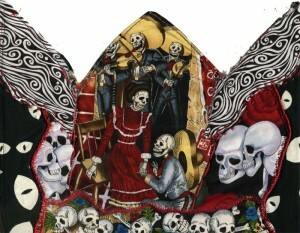 It’s like a medieval danse macabre and so cheery with the stitching and details and fabrics, this rocks! Can’t wait to see it finished – this one looks like fun! Hi Cynthia…I am finally catching up with other BJP members today! I am sorry to comment on your September page here, but I wanted you to know it is wonderful! What a fun piece! Full of life and color and you did a great job portraying yourself and school! Your beadwork on this page turned out great and I love her hair!!! I bet you are a wonderful art teacher! It looks like you are off to a great start for October. Awesome fabric! I look forward to seeing your monthly pages!